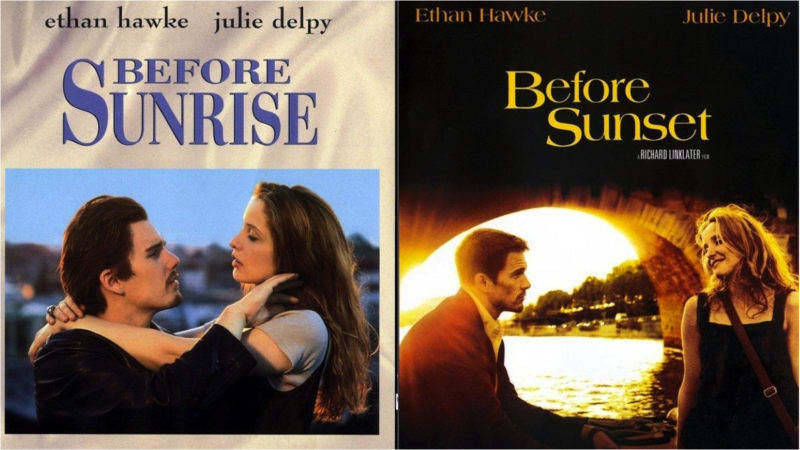 I recently rewatched the movies “Before Sunrise” and “Before Sunset,” which, if you haven’t seen or heard of them, are rather amazing. In the first, “Before Sunrise,” which came out in 1995, two early-twenty-somethings played by Ethan Hawke (Jesse) and Julie Delpy (Celine) meet on the train from Budapest to Vienna. Jesse has one night before his plane leaves back for America and he convinces Celine to spend the night with him wandering around Vienna, where they talk about life, love, dreams, everything. “Before Sunset,” which came out in 2004, picks up after those intervening nine years. Now in their thirties, Jesse and Celine walk around Paris before Jesse has to fly back to the US, and this time they’re dealing with the weight of real adulthood and exude a palpable sense of nostalgia and regret. Then, later, they reconnect after nine years and test the strength of that brief connection. The first time I watched these movies was around 2004-2005, shortly after “Before Sunset” came out, when I was in my early twenties and still in the exciting early days of a relationship. Of the two movies I naturally identified most strongly with “Before Sunrise,” the younger movie of the two. I was roughly the same age as the characters, the world seemed full of endless possibilities, and my future was so excitingly uncertain. But now, at age 31, I re-watched the movies at a vastly different place in my life and it was like watching completely different movies. Now “Before Sunrise” was an exercise in nostalgia, remembering how intense conversations felt at that age, the sense of adventure, and the brave early twenties naivety of thinking life will be completely easy because we are the special ones, at long last, that truly get how the world really works. And now it’s “Before Sunset” that I identify with the most, not least of which because it turns out, like Jesse, that this year I was having a novel come out at the same time that I was starting a new life with some of the same weighty thoughts of what might have been. (Though I have not, sadly, done a reading at “Shakespeare & Company” in Paris like Jesse). That intense melancholy of “Before Sunset” that I once found almost maudlin is something I now see all around me in my peers. It’s the quarter-life crisis of reaching a certain point in your life just by doing the right thing and hitting the right benchmarks of college, first job, dating, marriage, before inevitably being beset by forces outside of your control. There’s a sense of wandering and uncertainty that sets in when you begin to face the weight of major decisions and choosing the right relationship (or not) or sensing you’re in the wrong career. Your early twenties are the time when you think you have everything figured out; at some point before the end of that decade you realize that you don’t. What’s amazing about these movies is that because they’re set nine years apart they thoroughly embody this passage of time and maturation that we all go through, while at the same time retaining that essential magic between Jesse and Celine. Life moves on, we change, we age, and yet something essential remains. And that’s the amazing thing about art. These movies haven’t changed at all since I saw them last, that essence hasn’t moved a bit. But I have changed, the world has changed, and how we all respond to works of art evolves. The movies may be the same but they mean something different than they used to and they’ll continue to change while remaining exactly the same. But no matter what happens I’m sure my feelings about these movies, so bound up with my own personal history, will continue to change as I revisit them at different stages in life. That’s the beauty of stories. They change with us and always give us something new. I've never seen these movies, but I'm intrigued now. I agree, it's interesting how a movie can have one impact on our life at one age and a completely different impact at another age. Thanks for the nudge. What you said. I have had that same experience with both art and reality. Movies that were current for me when I was twenty something felt hip, connected. Now they feel nostalgic. And the same goes for people who fascinated me at twenty one. I've seen some of them since and whatever connection we had then is…absent. Once or twice the feeling of loss left me thinking I might rather not have run into them again. It knocked the bloom off the memory, I guess. Which is why art is wonderful in its steadfastness. We can revisit the movie, the book and measure the ways we have changed against it. Thanks for the thoughtful post. Having only seen the second one, I can't say for certain, but I think I know what you're getting at. This is why I re-read books. At least my all time favorites. I always find something different, because I'm different. No two movies have impacted my writing more. Thank you for this wonderful post. Interesting. I've never seen these movies but now I want to! Though as a young twenty-something who clearly knows everything about how the world works (lol), I would argue that the quarter life crisis happens much earlier. Or least it has seem to among my friends. It happens in college, right when you're about to get out and you realize that every decision you make right now will shape the entire rest of your life. Do you move across the country or stay in the safety of your home region? Do you marry that guy/girl? Do you continue on this path that could lead to stability but a cubicle or do you jump at a risk that could lead to adventure and possibly complete failure? To my friends and me, the quarter life crisis was the whole concept that whatever you chose now can lead to that midlife crisis of "holy crap where did my life go?" And I contend a good quarter life crisis, with the right decisions made, can cause there to be no midlife crisis. Terrific illustration, in the context of movies, of something the French literary critic Roland Barth said about books: every book is two books–the one the writer writes, and the one the reader reads. In each case, the reader or viewer brings to the piece their own life experiences, which are inevitably different from the author's/actors'/producer's/director's. And the passage of time, as you've seen, adds to those differences. This happened to me recently with one of my favorite books, Jane Eyre. When I read it in high school, I intensely identified with Jane, particularly in the beginning of the book when she's treated so badly by her guardians. I couldn't believe how unjust they were. Reading it now – with a seven year old drama queen for a daughter – I realize that Jane was having a massive tantrum! I might have locked her in the red bedroom too! Amazing how circumstance changes perspective! You nailed it, Nathan, our perception changes as we change. It depends where you are on the life horizon. If a movie or book can encapsulate that, we tend to keep that story in our memories. That feeling of I-thought-I-knew- about-life-but-now-I'm-not-so-sure is the beginning of wisdom. Very adroit of you, Nathan, to recognize this change in yourself. Your early twenties are the time when you think you have everything figured out; at some point before the end of that decade you realize that you don't. It's true that age destroys one's memory. At age 17 I had all of the answers. Now I often struggle to come up with even a workable compromise. That was lovely and poignant. I love those movies. Back in my mid twenties I turned down an internship with Richard Linklater's production company to take a "real job" and it was sort of a thing between choosing my dreams (and continuing to be broke) or becoming a "grown-up" with health insurance and a steady income. I have lots of what ifs lingering in the back of my brain. This is a beautiful post, and told with insight. I see a subtle wisdom hiding a layer or two down that strikes me as integral to the overall discussion: as artists (writers) we must see the connections between what might seem inconsequential moments but are really more than that, and then translate that into art. Like a filmmaker, we are drawing the audience's eye to those moments, shining a bit of light on them and saying, "This is important. You should pay attention." If done well, a book can, just like these movies, offer readers a different but equally valuable experience as their lives progress. Thank you for sharing this. It's causing me to think about how I might better apply this to my own writing. I need to pay better attention so I can recognize these moments of art and capture them on paper, and eventually offer them to readers. Nathan, I've been reading your blog for years, and I think this is my favorite post you've written. I've had very similar experiences with art, including with Before Sunrise & Before Sunset, most notably with Eternal Sunshine of the Spotless Mind – a movie that meant so much to me as a teenager, and changes in meaning with each growing year. Thanks for the insightful and thought-provoking post. I think that's what Led Zepplin meant, in part, when they said The Song Remains The Same. These are now on my list of to-watch! Thanks! Love this post. I once watched Before Sunrise three times in succession in ONE night (TBS marathon or something). I love it so much. I still find Before Sunset so sad, but I agree. We change, and great art speaks a thousand different things depending on where we are in life when we experience it. Pre-twenties I was convinced my writing should change the world a certain direction. I.e., people had to get out of it This Message or That One – whatever I intended with it. Now I just hope to write things that life can speak through. And these movies are such perfect examples of that. Wonderful commentary, Nathan. That is the beauty of art, and stories I think in particular: What we get out of them largely depends on what we carry within us. Each person's interpretation of a book or movie is going to be different simply because we are different individuals. In this same way, we are each different people at different stages of our own lives. I remember when I first began teaching high school English in my mid-thirties. It was the first time I had picked up To Kill a Mockingbird since I was in high school myself. Wow. It was a completely different story! Very insightful. I've been noticing some of the same things lately, as I round the corner of 30. Who knows what 40 will bring? Such a poignant and touching post. Thank you. I was moved by this. I don't understand why, but it does seem as though grief and wisdom go hand in hand. And I completely agree that as we grow, we look at art with new eyes. What's really strange to me is when I watch or read something and find I've outgrown it. And then I re-visit it a few years later, and find I've re-grown into it. The movie that immediately comes to mind is "Little Women" (1994). When I first saw the movie as a teenager, I fell in love with Laurie and I thought Jo had too. When she told him she couldn't marry him, my heart broke. I just didn't understand how she could fall for that old professor. When I watched it again probably ten years later, now a married woman, my perspective was different. Even though I still felt for Laurie, I could see that the deeper love she felt for Friedrich was the real deal, and would be ultimately fulfilling. And so romantic! I get butterflies just thinking about it. I love your thoughts on how art changes as we grow more conscious. As an artist, and as a person who values the arts, I have strongly felt that what one finds in art often grows as they grow. And therein lies one of the pivotal benchmarks of art. A shallower work, (and I am not putting down shallower works, they have their place too), one grows weary of hearing it too often, seeing it too often, etc, because in fact it becomes obvious in its totality and thus redundant, like a skipping record. In a true work of "art", it continues to grow and deepen over time and years, especially with the parallel growth of the observer. Fascinating perceptions from you, Nathan, and your readers. Thanks all. Reality is such a tenuous thing, makes me wonder if it's worth/valid getting upset or angry over apparent hurts or slights. Understanding is everything,and I wish I had more. Agreed!!! Once again, you have reached in and plucked something that I think about all the time from my mind! The subtle passage of time changes us to the core, yet there is that deeper core–maybe in the deepest part of our souls, that remains hidden until some form of art (a song, a movie, a photograph)fans it's flame when we least expect it. I really enjoyed this post. Thank you! I just added these two to my must see movie list. Thanks for the recommendation, and the thoughtful post. I agree it's one of my all-time favorites from you. I fell in love with Before Sunrise in 1995. When Before Sunset came out a few years later, I couldn't wait and was so excited to see how much the characters had changed and how much they hadn't. It's a beautiful pair of movies and I'm glad I had the experience of watching them as they were released and when I was in the right time of my life for each. I don't know how I feel about a third installment, but if there is one, I'm sure I will watch it and love it. Fabulous insight. I never thought about that before. Our perspective changes as we age. When I re-read a novel after several years, I notice things I hadn't before. Thanks! Such great insight. Thanks for sharing. Life is such a great adventure, isn't it? This is a great post–and a very *apropos* reminder for me. I'd forgotten about these movies, but my current WIP touches on some of those issues: how love–that instantaneous miracle of discovering another person–feels like when you're 20, and then later having the experience "restored", like TS Eliot says, "in a different way, beyond any meaning we can assign to happiness." I need to watch these films again. You know, I have that "art changes with you" thing with books as well–Love In Times of Cholera, for example, is a book I've been reading for–oh, twenty years or so. And every time I come back to it it has more to give, more to find–and those things change over time. The best post by you that I've read. My friend and I were just talking about this same thing with books. We'll re-read a book and get something completely different out of it than when we first read it. It's amazing to sit with a group of women at book club and see how much our personal histories influenced our interpretations of the book–one book in particular felt like we all read an entirely different book. Also, these movies have been on my watch list forever, and since I'm already older than the "Before Sunset" age group, I'm curious to see how I'll view it. Beautiful post. You've summed it up so well – you know everything in your early 20's, figure out around 30 that you don't. So what happens in your late 30's? You discover that not knowing everything is what makes life worth living. You realize that the prison you made for yourself with all those early decisions is just an illusion after all. You come to understand risk in a entirely different way. You start trying on new identities. Thanks for this post, Nathan. It's so true that we can revisit books and movies as we age and experience them completely differently. I saw half of Before Sunrise in the 90s but never finished it and never saw Before Sunset. Now I want to sit down and watch them back to back. Celine and Jesse also made an appearance in Waking Life in 2001, but I can do without seeing that movie again. Very nice post! It's been quite awhile since I've seen those movies, and I think I'd like to try them again. I too have never seen those movies, Nathan. However, seeing that I am twice as old as you,(four years shy of seventy), I would probably react differently to them. At age 18 I married my first true love and stayed immmensely and intensely enamored of her for thirty-three years. Now I am six years into my second marriage which is as intense as the first, though in an entirely different way. Might we hear from you again on these movies forty years from now? If possible, should prove interesting. Thanks for the thought-provoking read today. This post is so perfectly on mark with how I've been feeling lately. Thanks for posting!- And I will have to see these flicks now. You're awesome Nathan. Having just turned 25, I relate to this post so much. I am constantly laughing about the "quarter life crisis" and even placed it in my novel. It really is everywhere. Along the same point, even when I rewatch Disney movies now, I realize how much I missed as a little girl! That's a lovely post Nathan. All the more so because I can identify with it all so well, now that I'm in my 30s, whereas I'll bet if I'd been 25 and reading this I would have dismissed it saying "nonsense! it's all in what you choose to do!" The ending to the second movie was baffling to me. In the first movie, Jesse feels he must get on the plane and fly back home, which he does. But as with most people of that age, his sense of commitment is exaggerated. In reality, he has no responsibilities, and no commitments to anyone other than himself – essentially, he doesn't actually have to get on that plane. He's young, and can afford to make the 'wrong' decision, which in reality might be the right one. The only thing that forces him to get onto the plane is an idea he's planted in his own mind: "I'm a busy person… I have people to see, places to go, things to do." In the second movie, however, he's married, and has a young child. He now has responsibilities. Here's the part that baffles me: in the second movie, at the end, he doesn't get on the plane. That, to me, was just wrong. I would have much preferred it if he had said to Celine: "I'm only realizing it now… ten years ago, I didn't have to get on that plane. I didn't have to go back home at all. I could have stayed with you in Vienna." I wanted Jesse to realize that he can no longer make that decision, that he now has to get onto that plane because people back home are depending on him. He's not that young kid anymore who can go anywhere and do whatever he wants. This is kind of how life works. You look back in regret at the decisions you made. Today, however, even though you've acquired wisdom, you're no longer in the position to make the decision you should have made if only you had known then what you know now. Essentially, you now know which decision is the right one, but you can't make it, because the circumstances of your life have changed drastically. "There is a tide in the affairs of men which, taken at the flood, leads on to fortune. On such a full sea are we now afloat and we must take the current when it serves or lose our ventures." Any thoughts on this, Nathan? I own both of these movies on DVD, and have been meaning to watch them again on my iPad. But wow, these movies take a lot out of me. I felt drained when I watched Before Sunset. Also, I'm still extremely angry at you for rejecting my work. But that's okay. It's only a matter of time now before the world recognizes my talent and gives me the Nobel. Also, shouldn't the title for this blog have been: "How we change with art?" It's not the art that's changing? It's our own interpretation that changes. The art is always the same. That is a wonderful sentiment, how maturity and experience "deepens the meaning" in art. Its a revelation I've recently come to, listening to comedy or watching movies there's a new resonance to it because I can relate to the feeling in my bones rather than just identifying with them intellectually like I might have when I was less experienced. The third one will be devastating. I can't wait. haha.